Painting high rise buildings, simply due to their height, makes for a difficult, and potentially dangerous project. 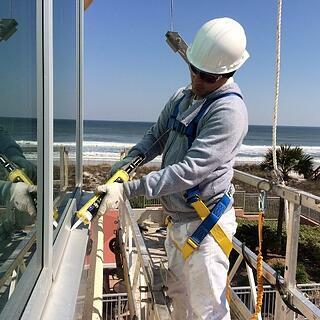 Performance Painting Contractors is highly experienced in painting high-rise buildings, and can ensure a safe, efficient job that will last for years. No matter what the layout or structure of your high-rise, we can find a way to access all areas. Sometimes how a building will be accessed during a project will dramatically affect the costs involved. We posses deep knowledge and skill with scaffolding, rigging, and suspended access equipment, which keeps our customers and employees safe. We use proven processes to ensure safety and efficiency on all of our projects. Choosing to work with Performance Painting Contractors will guarantee a great looking high rise, completed using the safest methods, the most thorough procedures and the most durable materials.